The Craft Workshop, a series of empowering workshops in beginner’s photography and filmmaking to elevate their craft and develop their brand. Taught by a team of local creative professionals, you will learn to master technical expertise, creativity, composition skills and social media marketing strategies. WHAT IS “THE CRAFT” WORKSHOP? 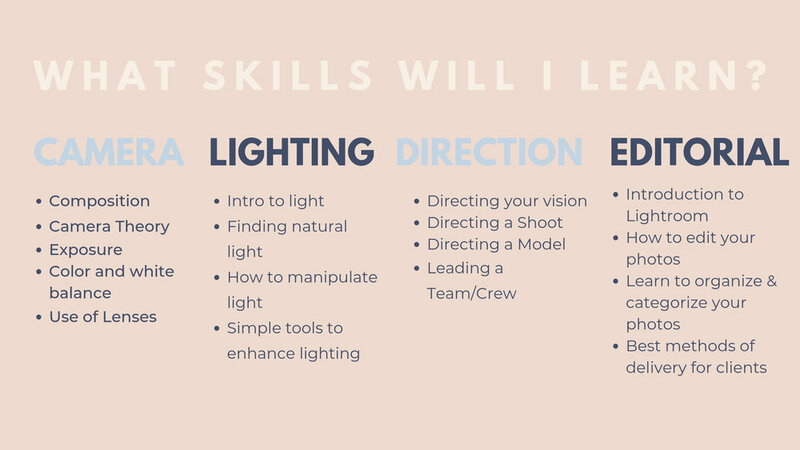 The Craft Workshop series is a body of events empowering photographers and filmmakers to elevate their craft & own their gifts. Photographers use their technical expertise, creativity, and composition skills to produce and preserve images that tell a story or record an event. We teach you how to master your tool so you can master your craft. The power of visuals has never been in such high demand. As professional creatives, we understand the empowerment behind the lens. Photography is in HOT DEMAND and it is not slowing down. Between social media and the world of marketing, learning photography is valuable tool in today's world. Now is the perfect time to jump in and take your craft to the next level. Learn the in's and out's of your camera & establish yourself in the marketplace. Your camera is your weapon, learn to master it. Edward first arrived to Santa Barbara in 2010 where he began his formal training in photography at Brooks Institute. In 2013, he graduated with a BFA in Pro Photo and remained in Santa Barbara as a base for his freelance endeavors. Edward currently shoots a variety of work including: editorial imagery for local publications, lifestyle/product work for nearby vineyards and professional headshots for a variety of corporate clients. formal training, he is diving in with Awakened Muse to begin bringing his expertise to the local community. Through focused workshops, he aspires to leave participants with the tools and resources they need to take their craft to the next level. Kara is a freelance editorial writer, stylist, photographer and social media consultant based in Santa Barbara, CA. After launching her business, Styled by Kara, in 2014 she began to partner with business owners and entrepreneurs to develop a successful online presence through use of styling, photography, graphic design and social media strategy within the digital landscape. She facilitates the growth of companies with content creation, social media management, and graphic design. Through these workshops, she hopes to provide a mindful and creative environment for students to learn major social media concepts while facilitating their brand development. Founder and CEO, Tamar Sasson is pleased to bring this workshop to Santa Barbara as a platform in beginner’s photography and filmmaking to connect with industry leaders in the creative community. Her passion for education and the arts sparked the creation of The Craft Workshop after 11 years of producing experience in the film industry delivering first-rate, successful content for several leading brands including Google, Neutrogena, and Biore. No problem! We have camera for rentals available for only $300 more. Please e-mail us to reserve your camera with “Reserve Camera for Craft Workshop” on the subject line. We need all requests in 2 week prior to the workshop. We have a limited amount of seats!